Despite a nasty cold early in the month, January was fairly productive, gaming-wise. I started and beat seven games, both short and long, and started an eighth. That unfinished game is Etrian Odyssey V, the latest in Atlus’ cartographical dungeon-crawling series, which I had put off starting for a few months in order to focus on Holiday Card work. As of this writing, I’m close to the end of the first Stratum, and the difficulty is starting to feel more punishing. This is not to say that EOV is easier than past entries; I think I just had a good handle on what to expect from this series when I first stepped into this latest Yggdrasil Labyrinth. One thing I’m really enjoying about EOV (besides the food-gathering and cooking, fantastic features which help cut down on trips back to town) is its back-to-basics approach. The previous two games in the main series introduced overworlds to explore between Strata, and in EOIV‘s case, I suspect that it was one reason why I was ultimately so bored with that game. EOV does away with such areas. Here, you’re in the labyrinth from the get-go, just like in the very first two games. While it’s a little odd to see this regression, it’s also quite refreshing. Hopefully, the game will continue to hold my attention as I ascend to new heights. The first game I beat way at the beginning of January also involved dungeons. Fidel Dungeon Rescue, which is about a very good dog who sets out to save his kidnapped master, has its feet in both the turn-based dungeon crawler and environmental puzzler realms. Each room is a puzzle that can be solved in more ways that one, but the most optimal solutions have the greatest rewards, the best being the XP which helps Fidel level up, increasing his overall health. The game’s most prominent feature—and, at times, greatest obstacle—is the title character’s leash. Fidel’s leash drags behind him, leaving a trail of places you’ve been before, and can be quickly retracted to rewind time and try out a different set of steps. However, the catch is that no square can be touched more than once, which can lead to the leash feeling like a barrier if its placement gets in your way. It’s a simple but well-implemented system that, along with the generous time constraints and dungeon layouts, lends the game its challenge. Fidel took me a fair number of attempts to get through, and once I did, whole new sets of challenges appeared. I completed two of these before moving on. Around the same time I started Fidel, I took up another, though very different, puzzle game: Alphabear: Hardcover Edition. 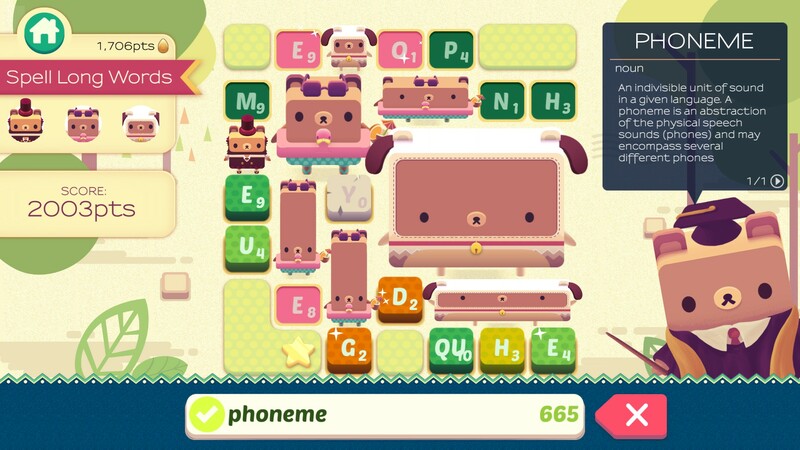 This version is a “pay once” PC port of the mobile title Alphabear. To play, one has to arrange randomly-generated letter tiles into words, which are then assigned points based on each letter’s countdown timer as well as other factors, like which bears you equipped before starting that stage. Creating words eliminates the tiles used, which causes the bears around them to grow, leading to more points. Score enough points to gain new bears, level up existing ones, and/or unlock the next stage. The entire scoring system is… rather complicated. 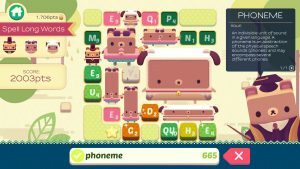 Despite its cute, whimsical aesthetic and inventive gameplay, Alphabear‘s challenges can spike in difficulty without warning, and some are just about impossible if you don’t have the right rare bears in your arsenal. This was my situation with Chapter 4-2, so I went back to some older stages to level up the bears I had; I also unlocked at least one new one. After I got through that stage, which took quite a long time, there were one or two other tough spots, but none nearly as bad. The difficulty balance and/or the rare/legendary bear drop rates clearly need some refinement, but apparently, the game’s progression was tweaked today, so perhaps this complaint is moot now. It’s also free to play this weekend on Steam, so you might want to give it a go. Anyway, because of those headaches, Alphabear was actually the third game I beat this year, since 4-2 led me to setting it down for awhile. The second was Danmaku Unlimited 2, which is another mobile port, as it turns out. If the title didn’t already give it away, this game is a vertically-oriented bullet hell shooter. Thankfully, the difficulty balance is perfect. As a casual shmup fan, I liked it so much that I reviewed it on Steam. It’s a lot of fun and very well made; there’s not much else I could’ve asked for. A few days before starting Danmaku Unlimited 2, I picked up my 3DS and, with some reservations, started Kirby Triple Deluxe, which would later become my fourth game beaten in 2018. I say “with some reservations” since I didn’t like the last Kirby I played and was sure that I had become burnt out on the series. Roughly two years later, I was relieved to discover that Kirby, especially the standard Kirby formula of enemy-chomping and ability-obtaining that returns in Triple Deluxe, is still something I can enjoy. In addition to being a straight-up solid Kirby game, this entry also features some nice callbacks to previous titles in the series. The endgame is also surprisingly lengthy and tough. Like with Danmaku Unlimited 2, there isn’t much else to say about Kirby Triple Deluxe except that it’s very, very good if you’re into this sort of thing. 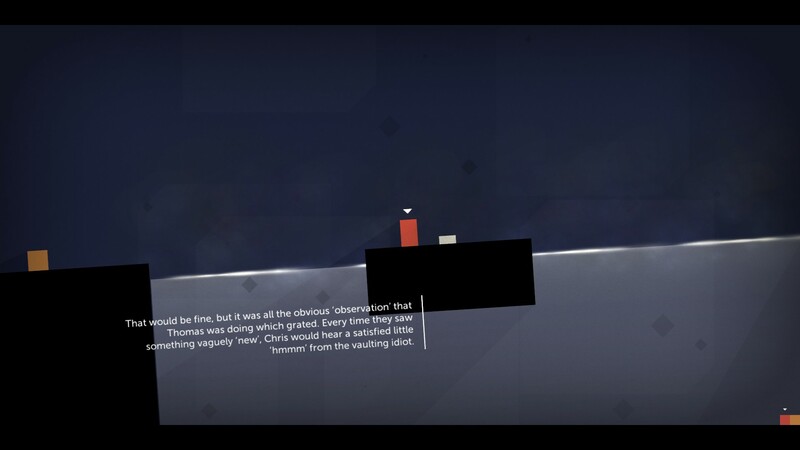 Another platformer was next up: Thomas Was Alone, which I received in a CAG Steam key trade. It’s a straightforward, puzzley game where rectangles and squares of varying abilities have to be delivered to specific points, much like Fidel, I and Me, and many other games. Controlling these objects is a little fussy, but the puzzles are generally well designed, albeit varying wildly in difficulty at times. What’s different this time around is the narration. 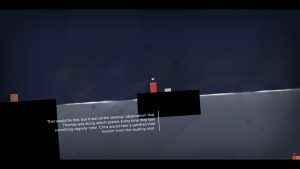 Each of the quadrilaterals is given a name, personality, and motivation, making what would otherwise be a well-designed but bog-standard game into one bristling with life. Some are full of themselves, some start out with a bit less confidence than they find later on, and some, like Thomas, are mainly just happy to have companions. This is one of those Indie Games That Everyone’s Played that I ignored for a long time, and it seems that that was a mistake. Fortunately, it’s now a mistake that’s been rectified. Finally, in wrapping up the month, I began my delve into Tale of Tales’ oeuvre via a Steam bundle I picked up during the last Summer Sale. Using the studio’s MobyGames page as a guideline for the release order, I started off with the oldest title in the collection. This was The Graveyard, an extremely short interactive black comedy. At least, that was how I read it, given what happens after the player guides the one controllable character, an old woman, to sit on a bench. To spoil what happens next: a jaunty song about death plays and then, at some random point, the old woman dies. The player can get up from the bench and leave the graveyard before the latter happens, but both of the times I tried to wait to do so after the song ended, she died. After that, I moved on to The Path. Inspired by the fairy tale “Little Red Riding Hood”, The Path has the player controlling one of six red-themed sisters, all with different ages and personalites, on a walk to their grandmother’s house. Stay on the path, and the game will decide you are a complete failure, and you’ll have to start over again. Leaving the path—and in doing so getting lost and discovering new things, including the Wolf—is how to succeed at the game. Each girl can go on their journey in any order you wish, and they each have a different, horrible experience at Grandmother’s House after encountering their own personal Wolves. 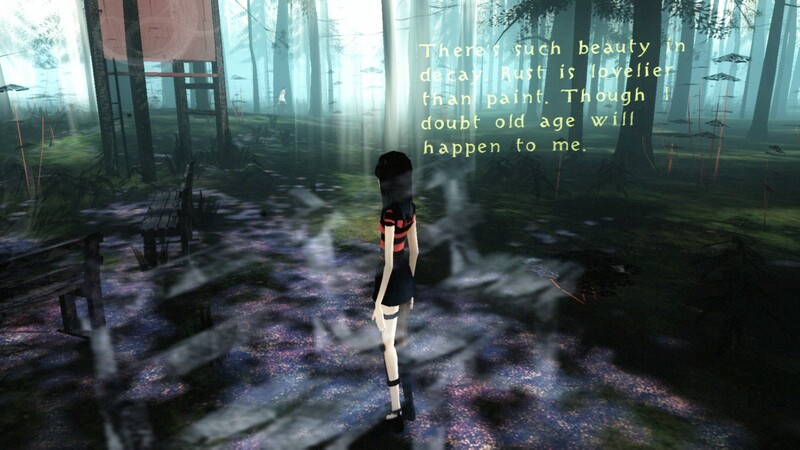 It’s an ambitious art game thick with metaphor, but is clearly ahead of its time in how it incorporates gaming conventions. Rather than ignoring things like scores and stats, which a modern game of this sort might do, The Path includes them, and even relies on them to a certain extent. I’m not sure that this was an entirely appropriate choice except as a pisstake at more mainstream games’ expense. Other than that, I found The Path to be an interesting experience. And that’s it for January! Next up, besides more Etrian Odyssey V, are the rest of that Tale of Tales bundle and who knows what else. I’ve started February in a healthier spot than I did January—both literally and figuratively—but I also need to whittle down the number of JRPGs in my backlog. Right now, I have no idea if February will end with as many games beaten. As usual, we shall see.